Help baby transition from busy time to bedtime. 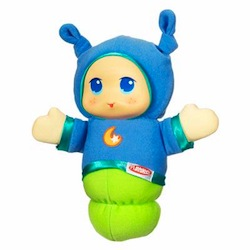 With a simple squeeze, the LULLABY GLOWORM toy lights up with a friendly, glowing face and soothing lullaby songs. Three modes of play include lights-only, short-play and long-play. Six different lullabies help little ones drift off to dreamland with their comforting, cuddly companion. " Bedtime friend comforts baby with gentle lights and lullaby tunes with a gentle hug from your child. " Three different modes of play -- light only, demo-mode or play mode! " Six different lullaby tunes. " Includes 3 "AA" batteries. " Ages birth and up.